Tragic news, just read it. I hope and pray he makes it. Thanks for posting that Red. His body and his head did that. an induced coma. Gives him a best shot of staying alive while his body tries to mend enough. He is still on the critical list. If I wasnt such a big ugly SOB I wouldn't have made it. I really hope he pulls through and recovers enough to enjoy some quality of life. Seriously injured in bicycle traffic accident in eastern Italy. Ironic that Nicky could have avoided serious injury in nearly three (3) decades of motorcycle racing, including 10 years where almost every race offered top speeds over 200 mph EVERY LAP, every practice session, many weekends per year. The photo’s in the above article show damage to the vehicles that would be very expectable for a bicycle impact with a car. The shortening of the bicycle’s wheelbase is consistent with the bicycle directly impacting the car. The damage to the car windshield attests to an impact by Nicky’s upper body. 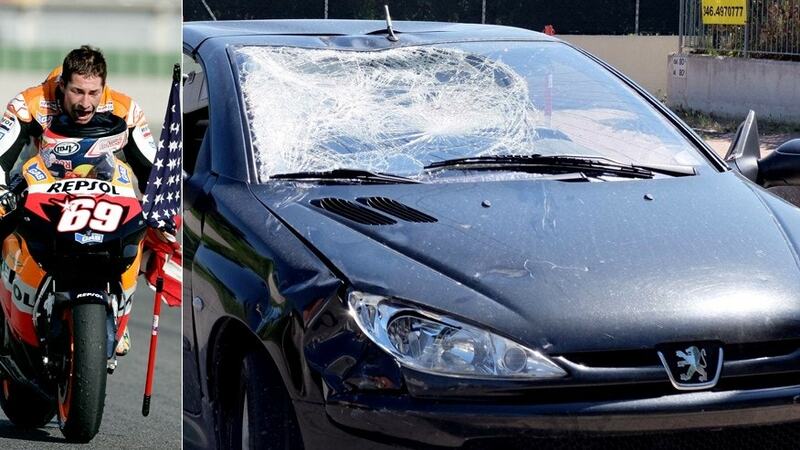 The windshield impact was probably the least of Nicky’s injury; the windshield would collapse and receive impact energy from the body and (relatively) slowly dissipate that energy, mitigating injury. More serious it the damage to the roofline in the center of the car, over the windshield. This is usually a “hard part” of the car, and resists deformation in an impact. If Nicky’s head hit the roofline, that could easily be the most serious injury of the whole impact. We respect Nicky, and wish him well………. One of the true gentlemen of the sport. Left us far too soon. May he rest in peace. So sad to lose such a good man so soon. You will be missed !